Once again, Amazon has put out a terrific tablet for a dirt-cheap price. We own two of the "old" Fire 7s and they are great for traveling; very lightweight and fully functional as a mid-range tablet. 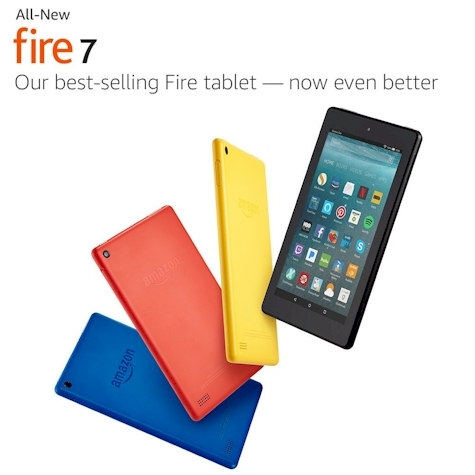 Amazon has now got the new Fire 7 8-GB for $29.99 (normally $49.99, 40% off) and the 16-GB for $49.99 (normally $69.99; 28% off). A word of advice: if you are going to watch movies or play games on your Fire, get the 16-GB. This tablet got 4.1 out of 5 stars over 12,179 customer reviews and comes in 4 colors. Enhance your entertainment experience with features you only get from Amazon, including ASAP, X-Ray, On Deck, Blue Shade, and FreeTime Parental Controls.